My latest wall - shortly made after my Fate/Stay Night wallie. 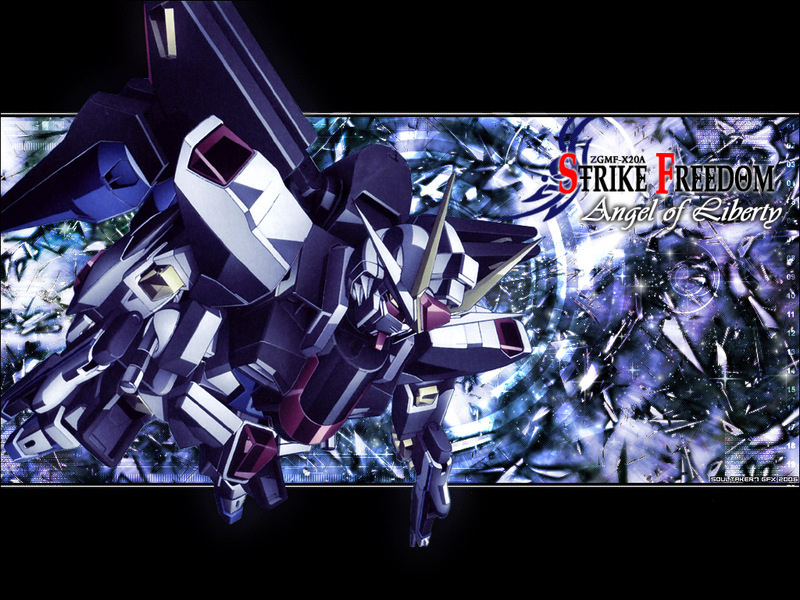 Took one hour and a half to make with more than thirty minutes spent on fixing a render covered with advertisements for the 10th drama CD of GSD - "Kira Yamato x Strike Freedom". Normally the left rifle should have been vectored and be visible here but I gave up on it as the laws of perspective ganged on me and yielded no satisfying results. Anyway, this was made for seed-forum.com - the GFX section. Fav is appreciated but REVIEWS are even better! Man!, where did u get the scan of strike freedom like that. This looks so cool. I kinda have to agree with ChopperDave that u need improvments for blending and render. The bg is ok..... and everything is great. This is a really cool mecha wallpaper! Looks like the original one that I saw at Gundam Official site! I liked the scan of freedom and your title is very nice! Congratulations! I was really captured by this wall when I sighted the thumbnail! Your really have nice ideas for Gundam wallies! woah... nice wallpaper. thanks for sharing ! Good job and nice wallpaper, I like it , thanks for sharing ! very nice strike freedom wallpaper.. Please upload the original scan, I would like to work with it someday soon (I'm quite busy these days).